Within the last ten years strong evidence has emerged for the essential role of Vascular Endothelial Growth Factor (VEGF) in vasculogenesis and angiogenesis. The development of blood vessels includes two processes. Vasculogenesis is the embryologic formation of blood islands, the earliest vascular system, by the differentiation from mesoderm of angioblasts and hemopoietic precursor cells. Angiogenesis is the sprouting of pre-existing vessels to form the vascular tree. In addition to a key role in embryological development, angiogenesis is essential for such things as wound healing and tumor growth. While many growth factors exhibit angiogenic activity (FGFs, PDGF, TGF-α and HGF), evidence points to a special role for VEGF. VEGF is a dimeric glycoprotein that stimulates endothelial cells, induces angiogenesis and increases vascular permeability. 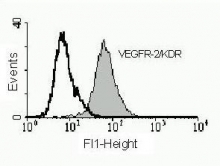 The receptors for VEGF are VEGFR-1 (Flt-1) and VEGFR-2 (KDR in humans and Flk-1 in mice). 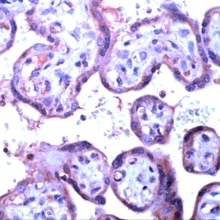 Homozygous mutants of the VEGF receptors lead to lack of vasculogenesis and death of mouse embryos at about day 8, indicating that VEGF receptors are essential for formation of a normal vasculature. In addition to VEGF (VEGF-A) there exist three additional VEGF family members: VEGF-B, VEGF-C and VEGF-D. Less is known about the function and regulation of VEGF-B, -C, and -D, but they do not seem to be regulated by the major pathways that control VEGF-A. VEGF-C and D are ligands for VEGFR-2 but also for the third VEGF Receptor VEGFR-3 (Flt-4), whereas VEGF-B binds only to VEGFR-1. Like other growth factor receptors, upon ligand binding VEGFR-2 dimerizes and is autophosphorylated on multiple tyrosine residues. These phosphotyrosine sites are involved in regulation of intrinsic tyrosine kinase activity or serve as binding sites for SH2 domains and phosphotyrosine binding (PTB) domains of downstream signaling proteins. Fig. 2: Immunofluorescence staining (green) using a polyclonal antibody directed against the C-terminal end of native soluble VEGFR-1/Flt-1 Cat.-No. DP3522 (2a) and a monoclonal antibody directed against the extracellular domain of the membrane-bound VEGFR-1/Flt-1 Cat.-No. DM3507 (2b). 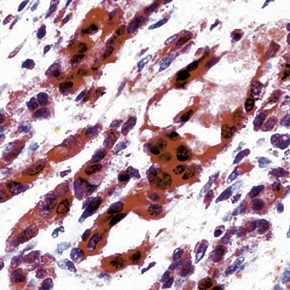 Two neighboring sections of a Human Vein (V), located near a hemangioma, are visualized. 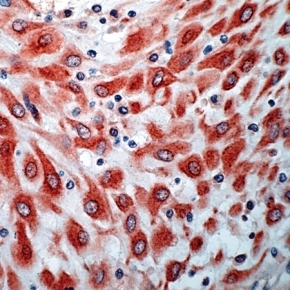 The antibody against the soluble VEGFR-1/Flt-1 marked single cells (arrows) within the media and adventitia of the vein. 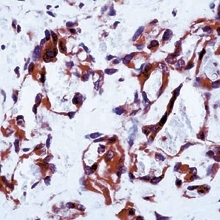 The antibody against the membrane-bound VEGFR-1/Flt-1 marked single cells (arrows) and the endothelium (arrowhead) of the vein. Cell nuclei are stained with Dapi (blue).